See the first photos from "Roseanne" spinoff "The Conners"
After the dramatic cancellation of "Roseanne" in May and namesake actress Roseanne Barr's firing, the Conner family is back, albeit without its matriarch. ABC released the first photos of spinoff show "The Conners," which is set to premiere on Oct. 16. The photos showed stars Lecy Goranson, who plays Becky Conner, Sara Gilbert (Darlene Conner), John Goodman (Dan Conner) and Laurie Metcalf (Jackie Harris) on an episode called "Keep on Truckin'." The description for the episode says, "A sudden turn of events forces the Conners to face the daily struggles of life in Lanford in a way they never have before." This might refer to the death of Barr's character. Goodman said previously that he believed Barr's character would be killed off, and that his character will be "mopey and sad" because his wife has died. 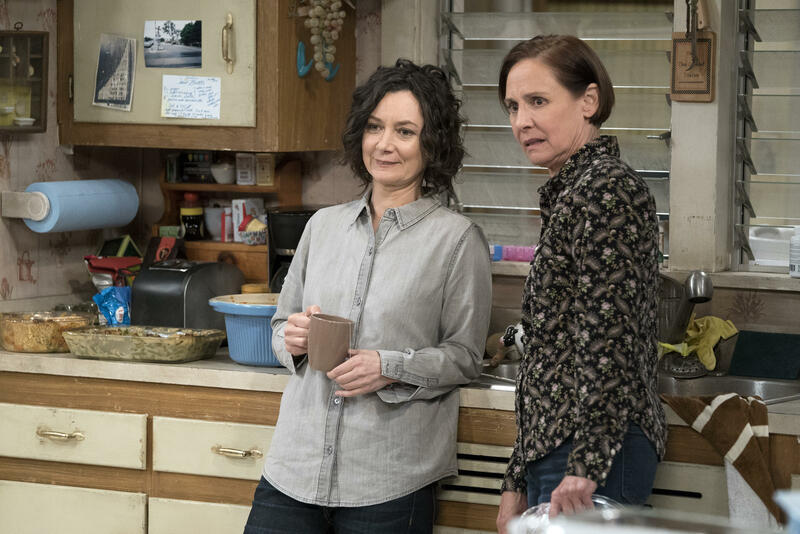 In June, ABC announced that it was ordering 10 episodes of "The Conners" after Barr agreed to forgo any creative or financial participation in it. The actors issued a joint statement about the spinoff: "We have received a tremendous amount of support from fans of our show, and it's clear that these characters not only have a place in our hearts, but in the hearts and homes of our audience. We all came back last season because we wanted to tell stories about the challenges facing a working-class family today. We are so happy to have the opportunity to return with the cast and crew to continue to share those stories through love and laughter." The revival of the hit 1988-97 sitcom "Roseanne" was axed by ABC after Barr posted a tweet likening former Obama adviser Valerie Jarrett to progeny of the Muslim Brotherhood and "Planet of the Apes." Many of Barr's cast mates denounced her comments, including former co-star Michael Fishman, who played her son D.J. Conner on "Roseanne." He said he "condemned" Barr's tweet about Jarrett and said he was "devastated" by the show's cancellation. He said he was especially disappointed because the show embraced inclusivity. Barr has apologized for her comments, but also said she was fired because she is a Trump supporter. "Now instead what happened, about 40 minutes after that, my show was canceled before even one advertiser pulled out, and I was labeled a racist," she said. "Why, you ask? Well, the answer is simple: Because I voted for Donald Trump, and that is not allowed in Hollywood."